Nurturing a passion for outstanding design. The Department of Interior Architecture offers a major in Interior Design leading to a Bachelor of Fine Arts degree. Within the Interior Design curriculum, all students in the major also complete a fine arts foundation and engage in Catalyst. Through the arts Catalyst curriculum, students gain an overall arts perspective, participating in interdisciplinary workshops and coursework. 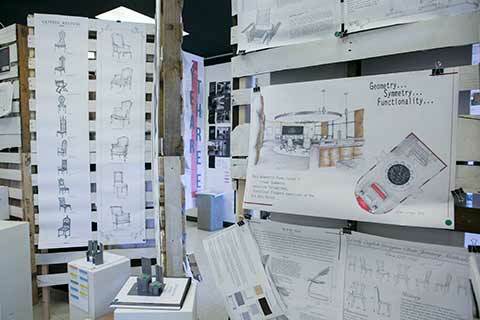 The department also offers a non-degree seeking concentration in Pre-Architecture. Students in this highly regarded program recently received recognition at the ASID/Summer Classic Teak Design Challenge in Birmingham as well as top honors at the Alabama Chapter of International Interior Design Association's annual event. The interior architecture studios combine state-of-the-art technology and learning centers with a vertical integration of student interaction. Freshman and sophomores visualize their academic process through exposure to juniors and seniors who play a mentoring role. Students have access to up-to-date technology including 3-D printers, large format plotters and scanners to assist them with their projects. Students have access to these workspaces around the clock. Samford fosters a holistic student learning approach to interior architecture instilling a passion for outstanding design that can shape and influence society for good. At the core, we produce graduates who appreciate aesthetic values with practical realties, are excellent communicators and problem solvers and are sensitive to global and cultural issues that impact design decisions. The Interior Design major and the Pre-Architecture concentration students share a common curriculum for the first two years of study. These foundation courses introduce applicable theory and skills, preparing the students for a more specific design direction: interior design or architecture. (See pathways chart, below.) The Bachelor of Fine Arts in Interior Design introduces a fine art foundation in the curriculum. The BFA in Interior Design is accredited by CIDA (the Council for Interior Design Accreditation). The Pre-Architecture concentration is a two-year, non-degree plan. Students choosing Pre-Architecture, and meeting admission requirements, may transfer seamlessly into the Bachelor of Arts in Architecture at Judson University, Elgin, Illinois, and continue into that school’s Masters of Architecture, a NAAB-accredited architectural program. This is the result of collaboration between Samford and Judson, with an articulation agreement outlining such. 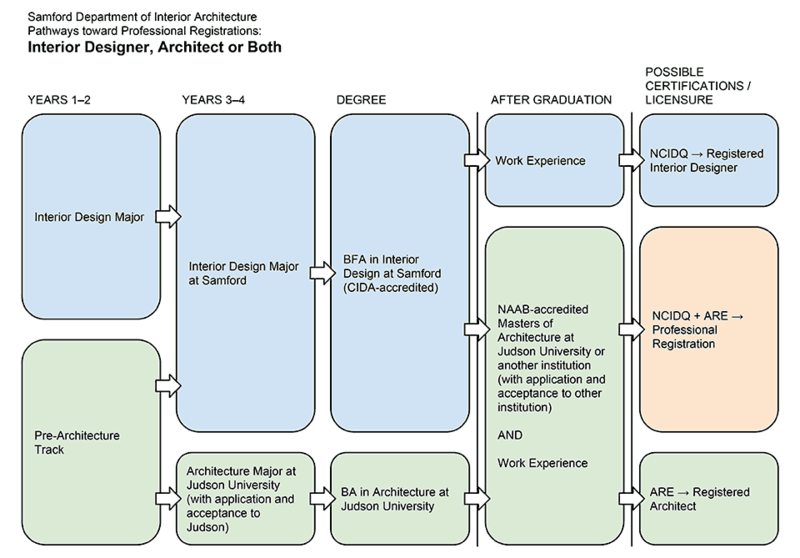 Pre-Architecture students who choose to remain at Samford University and complete the Bachelor of Fine Arts in Interior Design can then pursue the Masters of Architecture degree program at Judson University or at other universities that offer similar programs of study, pending application and acceptance. 100% (as of fall 2015) of those individuals remain employed in a design-related field. Field experiences are essential learning tools and include interaction with local design entities, travel to national design hubs and unique international mission projects. Samford works closely with the Birmingham business community providing internship opportunities, guest lecturers, jurors and professional critiques. Students visit construction sites, markets, showrooms, notable architecture and make valuable contacts within the industry. The Catalyst/Design Education for World Impact is the senior project that allows students to apply their skills to a real-world project. Recent undertakings include a medical clinic in Kolkata, India, church related facilities in Ecuador and a senior living home in the Dominican Republic. Students not only plan, design, and build facilities but also have the opportunity to travel and impact lives both domestically and globally with their talents. Samford has become an International Interior Design Association (IIDA) campus center, providing enrichment activities, professional connections, and service opportunities to Interior Design students. Comprised of students from all grade levels, IIDA provides a variety of student organized programs and activities including ASID/IIDA Student Day, portfolio review and mentoring opportunities. The organization also regularly volunteers both in the community and within our own department to complete a number of service projects. Our students have consistently demonstrated success in both advancing through the degree program and in finding employment — usually related to the major, and always benefiting from the skills they gain during their Samford experience. The program is demanding but fulfilling, and each class forms a strong bond of supportive community and growth, creating friendships that endure after graduation.